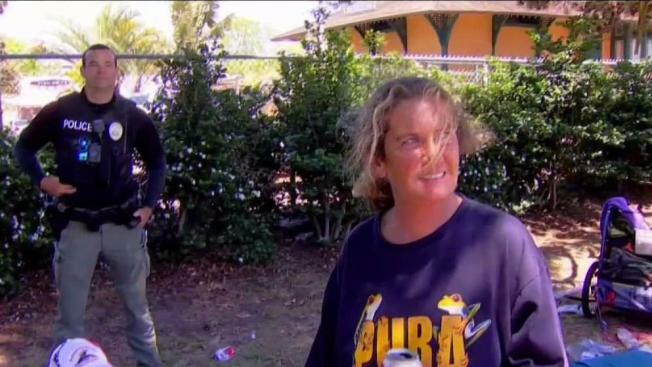 The city of Carlsbad has taken a new approach to combat a growing homelessness crisis in San Diego County by befriending those living on the streets. There are approximately 210 people living on the streets in Carlsbad and the city's latest attempt to address this is through something it is calling "compassionate enforcement." "They got to follow the rules, they have to follow the laws and if they don't we're going to address that, but we're also going to the tail end of it," Carlsbad Police Department (CPD) Sgt. Bryan Hargett said. Hargett leads a three-person Homeless Outreach Team with the CPD specially trained to build relationships with the homeless. "Believe it or not, I am one of the guys that appreciates what you're doing," said Scott, a homeless man that lives in a park in Carlsbad. "We appreciate that so." Hargett has been working with Scott for the past couple of month to get him off the streets. "He's not ready to make the next step," Hargett said. "We've reached out family, we've reached out to friends." After talking to Scott, Hargett next visits Dayve, who's proudly showing off her pet macaw, Giovanna. "We call her the 'tude-meister,'" she said. "She's my best friend." The Homeless Outreach Team knows and helps people like Dayve, who's been living on the streets for nearly 11 years. They helped Davye's boyfriend into a voluntary rehab facility and they're helping her file for social security. "They come here with respect and I give it back," Dayve said. "It's like brothers .. from another mother." Last Tuesday, the Carlsbad City Council approved funding for two full-time social workers to accompany the Homeless Outreach Team. They will help with individualized care and hopefully get people living on the streets into social programs more quickly. Hargett said it's a different style of policing. "It's a fun style," he said. "It's interesting to see how we're impacting the community in a different way."